Pampered, good-looking tires and wheels are just minutes away! Clean, protect and enhance wheels and tires with the Wolfgang Tire & Wheel Kit. This total tire care kit includes Wolfgang Tire & Wheel Cleaner and the impressive Wolfgang Black Diamond Tire Gel, plus tire applicators and a tire brush. The Wolfgang Tire & Wheel Kit includes everything you need to give your vehicle�s tire and wheels the look that turns heads. The Wolfgang Tire & Wheel Kit is safe and effective on all types of wheels and tires, from factory issue to the finest custom rims. Wolfgang Tire & Wheel Cleaner has a versatile, easy-to-use formula that works on aluminum, stainless steel, chrome, painted, clear coated, and plated wheels. Wolfgang Black Diamond Tire Gel renews the dark, black sheen on all tires. Wolfgang Tire & Wheel Cleaner boasts industrial strength cleaning power in a non-caustic, water-based formula! 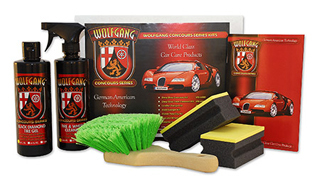 Wolfgang Tire & Wheel Cleaner is biodegradable, non-toxic, non-caustic, and gentle on skin. However, this thick, concentrated gel packs quite a punch when it comes to quickly and easily removing brake dust, road grime, oil and grease. As soon as you spray it on, Wolfgang Tire & Wheel Cleaner goes to work loosening and dissolving tough road grime. . It even penetrates below the surface of the rubber to extract deep, ground in dirt, brake dust, and tire dressing buildup. Tires and wheels will be left completely clean. Wolfgang Black Diamond Tire Gel makes tires shine with an advanced polymer formula with UV blockers and ozone repellants. The penetrating tire protectant bonds to the rubber for long-lasting protection. Wolfgang Black Diamond Tire Gel prolongs the life of your tires, conditioning and revitalizing them for up to two weeks, including a couple of washings! More than a tire dressing, Black Diamond Tire Gel keeps tire walls supple and hydrated to promote longevity. It�s environmentally safe, produces a like-new, deep black finish, lasts up to three or four times longer, and doesn�t sling off onto your car�s panels. This well-made, indestructible brush is practical, efficient and safe for all wheels. It has hundreds and hundreds of densely packed bristles, feathered at the tip for gentle agitating of any wheel surface, regardless of delicacy. The bristles are sturdy enough to attack tough road grease and grime on your tires as well. The brush is constructed of alkaline- and acid-resistant, 2� fibers, mounted on a non-slip, heavy-duty plastic handle. Cobra Flex Foam Tire Dressing Applicators are made of a unique foam composition that conforms to the curve of your tires� sidewalls. Foam applicators that are precut into a curve might not match the curvature of your vehicle�s particular tires. Cobra Flex Foam Tire Dressing Applicators flex to hug the rubber and apply a neat, even layer of tire dressing. Use these microfiber detailing cloths for drying, buffing, or as a finishing wipe down. Microfiber is designed to be light, strong, super-absorbent and quick drying. The fibers are non-abrasive, and are woven so tightly that it�s absolutely lint free and extremely durable. Unbelievably, these ultra-tough fibers are engineered to absorb seven times their weight in moisture. When using on windows, it produces a streak-free finish. For regular cleaning and maintenance of your wheels and tires, you can�t beat the Wolfgang Tire & Wheel Kit for performance and value. A total retail value of $61.96. Save $11.97! The cleaner does a great job. However the tire shine falls off the applicator pad.